The audiobooks are here! 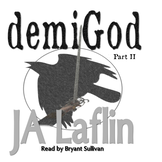 Narrated by the talented Bryant Sullivan, these unabridged audiobook editions of demiGod Parts I and II are available exclusively on Audible. JALaflin.com and all original materials (unless otherwise stated) are Copyrights of JA Laflin/Joshua Laflin/Agnec Press, 2014-2019.